Includes mounting screws, 2 sided tape and one blanking cap. New high performance, high density, Multi-Media module-based system. 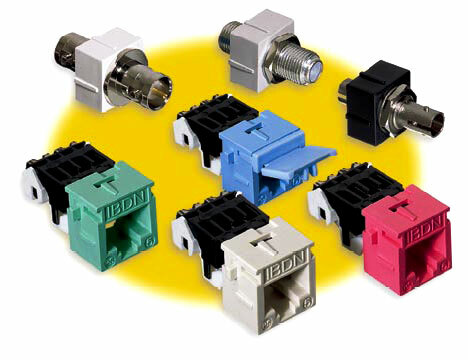 Modules are interchangeable and available for UTP, Coaxial and fiber environments. Use these adapters with every open office furniture application. The adapters accept GIGAFlex, EZ-MDVO as well as MDVO modules. The MDVO 106 adapters are designed for installations using standard NEMA electrical faceplates, also referred to as 106-type or duplex wallplates. 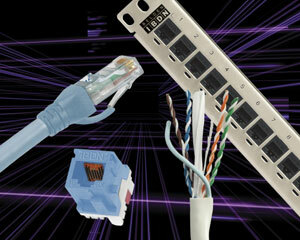 These adapters are ideal for coordinated electrical and telecommunications are required. These angled entry faceplates offer better patch cord protection and optimize patch cord bend radius control. Designed to accept MDVO modules. Compatible with all interface and face plates in this section. High quality Cat5E patch panels, with BIX connectors. Allows for standard wiring EIA/TIA 568A / 568B. Ports available: 24, 48, 72, 96.